Old Hollywood: Cozy Up with Your Lover. Cozy Up with Your Lover. 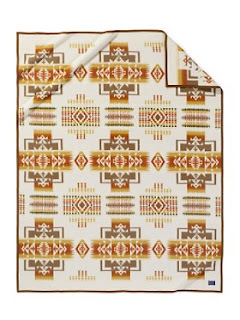 We just got a really thick shipment of Pendleton in, which is great because Valentine's Day is right around the corner and what better way to show you love someone than giving them something you can also use. So coze on up in there and get yourself some lovin'! This collectible Spirit of the Peoples blanket was designed in 2009 to commemorate our 100 years of weaving America’s spirit in our Pendleton, Oregon, mill. It is a celebration of the family. Six stripes represent the five generations that have led the company and the next generation that will lead us on. Directional crosses symbolize the four directions, homes to the Native Americans who were our first customers, and to all those who have come since. 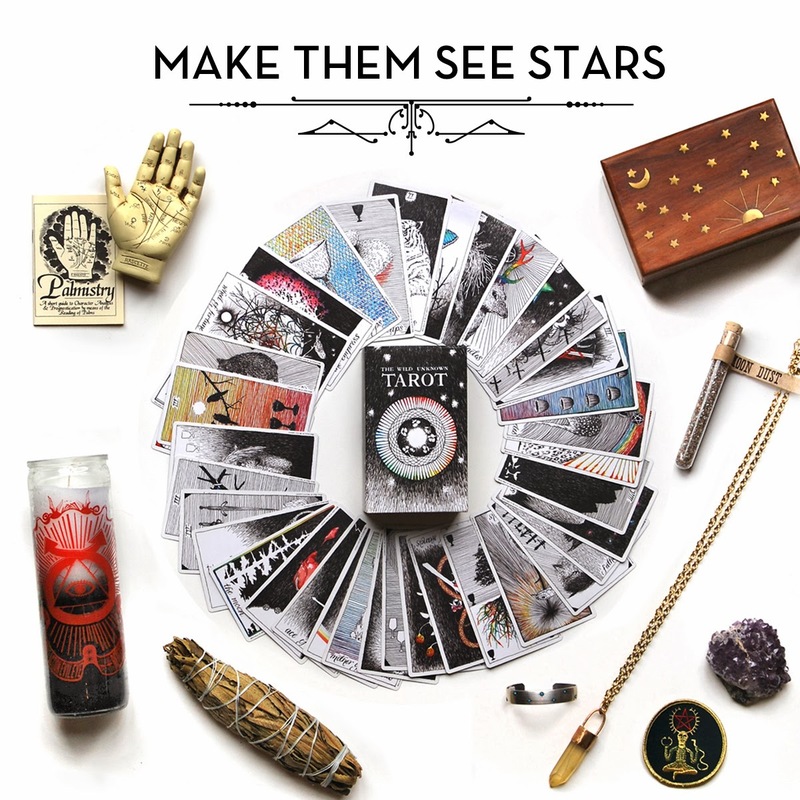 Arrowheads denote the strength and good fortune that have blessed our journey thus far. In 1923 President Harding and his wife visited the West to dedicate a portion of the Old Oregon Trail. At that ceremony, local Cayuse and Umatilla chiefs presented the First Lady with a Pendleton shawl inspired by the already famous Chief Joseph blanket. This robe from our Heritage Collection is comparable to a twin blanket, the size originally used as a ceremonial robe by Native Americans. 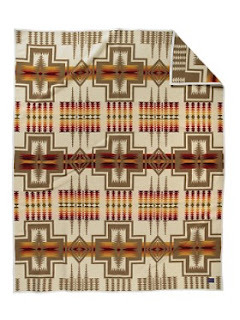 The Iroquois Turtle Blanket is a re-coloration of an early 1900s Pendleton design. It pays tribute to the Iroquois Confederacy, one of the oldest participatory democracies on earth, consisting of the Oneida, Seneca, Mohawk, Cayuga, Onondaga (and later the Tuscarora) Nations. The Turtle design was inspired by Iroquois, primarily Mohawk, legend. Long ago, the earth was covered with deep water and there were no people. 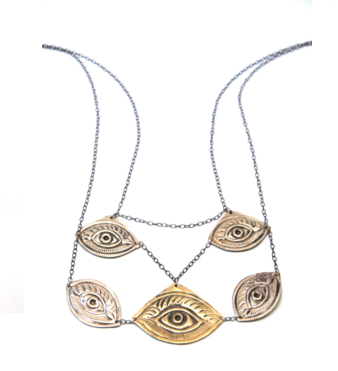 According to stories, the birds saw Skywoman fall from the sky. As she fell, she grabbed the roots of a tree from heaven. The birds spread their wings together to save her. Only the Turtle was strong enough to hold her, so they placed her on the turtle’s back. There she planted the root; and as her garden grew, Turtle grew in size first becoming a large island, then finally North America, known as Turtle Island. 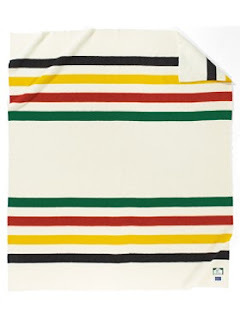 This blanket is an example of centerpoint design in which three major design elements fall in a row down the center of the blanket. 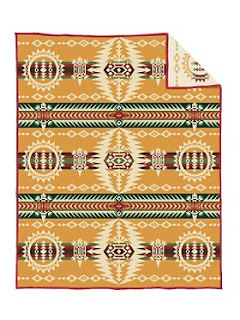 The joyful “Tree of Life” pattern is a traditional Navajo rug pictorial design first seen in the 1840s and still woven today. 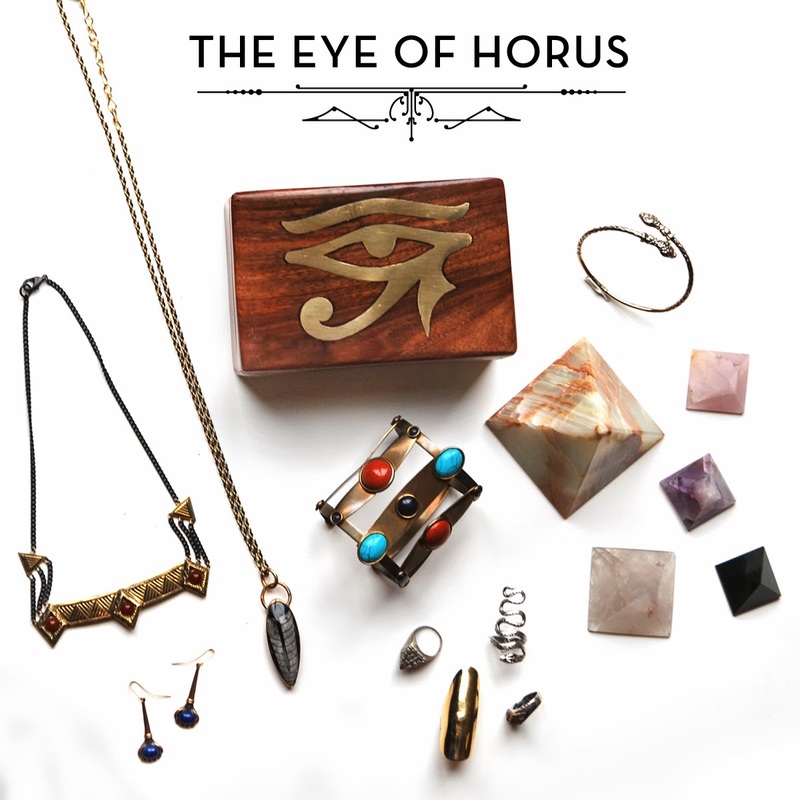 The image is an ancient and universal one among the peoples of the world. 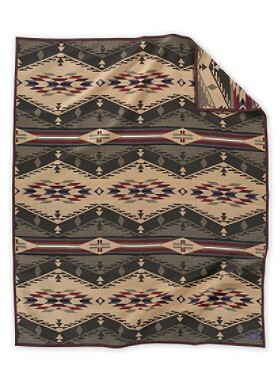 Native American weaving patterns vary somewhat but Pendleton's blanket interpretation is true to the common elements always included. A tree or young corn stalk is host to a bevy of bright birds. Corn, a Native American staple for centuries, represents life and abundance. 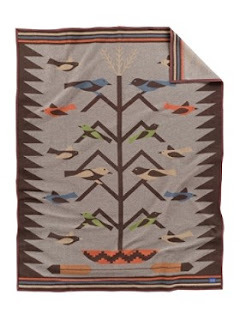 Often, as in Pendleton blanket design, the “tree” springs from a wedding basket. Tradition says that the many colorful birds represent the children of the marriage. Like most “Tree of Life” rugs, Pendleton's blanket has a plain, solid-color border.Napped. Felt-bound. 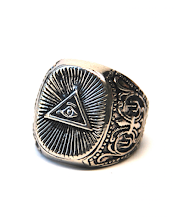 82% pure virgin wool/18% cotton. Dry clean. Made in the USA. The Pendleton Tribute Series pays homage to the American mills that pioneered the weaving of Indian trade blankets. 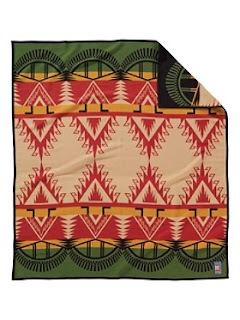 The Buell Manufacturing Company of St. Joseph, Missouri, offered blankets that were distinctly Navajo in design. 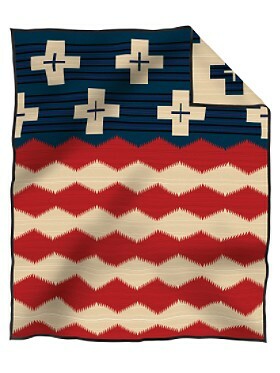 Buell designs were more directly related to traditional Native American weavings. 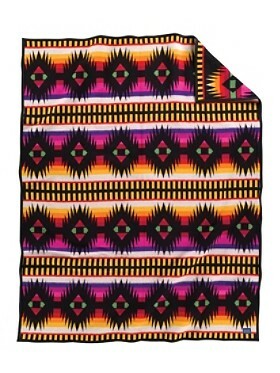 The pattern we have re-created was originally called "Aztec. Two centuries ago a band of Moache Utes were awestruck by a strange glow atop Aqua Fria Peak in the Sangre de Cristos Mountains. 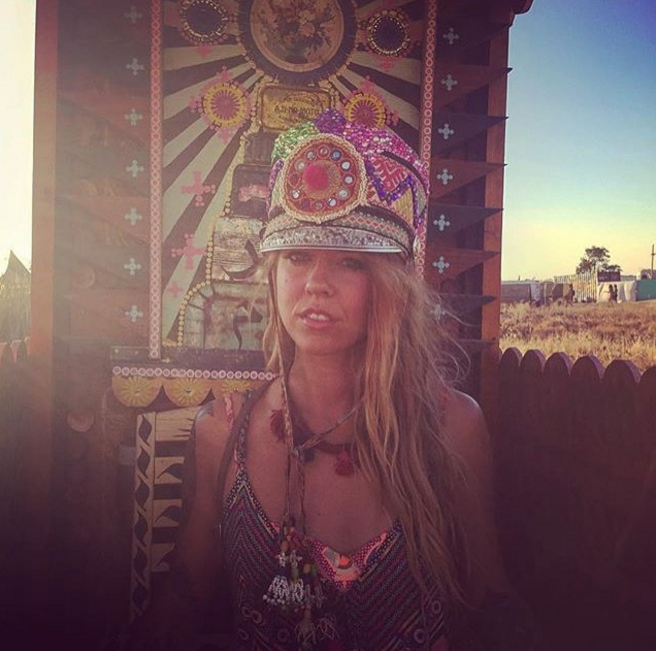 A tribal elder declared the breathtaking sight “fire of the gods.” The phenomenon became common during the tribe’s autumnal celebration of the Great Spirit. Traveling Franciscan friars renamed the sight “fire of angels” to reflect Christian beliefs. Indian agent Kit Carson saw the “fire” at dawn and dusk during fall and winter and attributed it to the sun hitting the frost on the trees. Later, settlers called the mountain Angel Fire Peak. And today the town of Angel Fire, New Mexico, still carries a name born of Native American, Spanish and pioneer cultures.